Current: Is Libya Disintegrating as a State? Is Libya Disintegrating as a State? More than two months after the death of Muammar Gaddafi – and nearly five months since he was removed from power – Libya’s new government faces problems in securing order and the unity of Libya as a state. The uprising that toppled Muammar Gaddafi last year may be over but the militias remain in place. (NTC) and its army have not been able to persuade the militias to join the new armed forces, nor have they been able to rein them in. More interested in guarding their independence than in fostering national unity, the brigades from what are virtually city-states have rebuffed the NTC’s entreaties to disband. They have also refused to allow the NTC access to prisoners, leaving the council in the dark about the senior Gaddafi officials they hold. At a recent press conference, NTC vice chairman Abd al-Hafiz Ghoga confessed that the government does not know where Gaddafi’s former intelligence chief, Abdallah Sanussi, is being held. The Zintani fighters holding Saif al-Islam Gaddafi have refused to surrender him to the national authorities. Militias have also been accused of violence and crime in Tripoli. However, over the past few weeks, units of the Libyan national army have stepped up their presence in Tripoli, urging regional militias to disband and join their forces. Many have scoffed at the offer, preferring instead to hold on to their heavy weapons. Tripoli is now an unruly patchwork of fiefdoms, each controlled by a different militia. Police are rarely seen – except when directing traffic – and there is no sign of the newly created national army. Although their presence on the streets significantly declined toward the end of December, militias still occupy security compounds previously used by Gaddafi’s forces. Their presence increases in the streets of Tripoli as night falls. Tripoli has two main militias. One is led by Abdel Hakim Belhadj, an Islamist who spent time in Taliban camps in Afghanistan and now runs his militia from a suite of rooms in a luxury Tripoli hotel. The other is headed by Abdullah Naker, a former electronics engineer who is openly disdainful of Belhadj. Other militias include fighters from Zintan, an anti-Gaddafi bastion southwest of the capital that controls the international airport. Militias from Misrata, east of Tripoli, have mostly withdrawn from central Tripoli but maintain a presence in the eastern outskirts of the city. Fighters from the Berber, or Amazigh, ethnic minority mark out their territory with their blue, green and yellow flags. 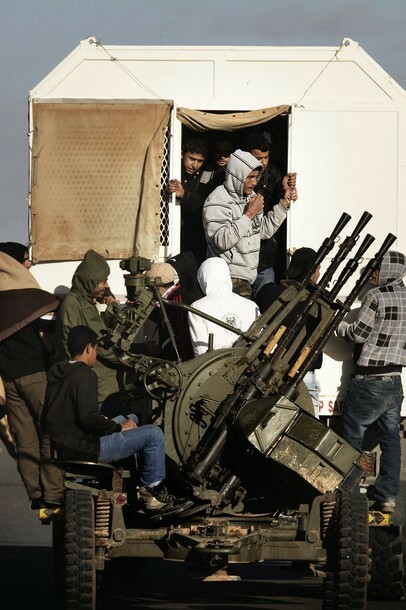 The residents and militias of Tripoli have been trying for months to persuade the Misrata and Zintan fighters who stormed the capital to topple the regime to go back to their home towns, but those fighters are staying put – and are accused of harassing the locals. They see themselves as the ones who shouldered the greatest burden in the battle to drive out Gaddafi, and they are suspicious of edicts by the NTC, which they see as self-appointed interlopers from Benghazi (the NTC’s recognition by the West and Arab governments as Libya’s legitimate government notwithstanding). The fighters of Zintan and Misrata are in no hurry to subordinate themselves to a national army led by returned exiles and a government of which they’re wary; nor are they willing to accept the authority of the Tripoli Military Council headed by the Islamist Abdel Hakim Belhadj, despite his endorsement by the NTC. Mindful of the political power that flows from being armed and organized, and determined to leverage that into a greater share of power and resources for the regions and towns they claim to represent, the regional militias are in no rush to give up their control of prized political real estate. The new Libyan government is too weak to confront the brigades. It is concentrating efforts on more pressing matters, such as lobbying the international community to release its frozen assets. The deep fissures of tribe, region, ideology, and sometimes even neighborhood that divide rival armed groups persist – and there’s no sign yet of the emergence of a central political authority with the military muscle to enforce its writ. With the government lacking the will and motivation to confront the brigades, the creation of a national fighting force to replace the regional units scattered throughout the country is unlikely to be accomplished anytime soon. The hundreds of militia forces that sprang up during the country’s eight-month revolution ransacked the army’s depots, making off with thousands of anti-tank cannons and anti-aircraft guns. Now that the revolution is over and former leader Muammar Gaddafi is dead, Libya’s new government wants them to return the weapons to the armories. The army is trying to take advantage of the crumbling economy in order to entice militia members to join the army. Married men receive 500 Libyan dinars per month ($322), and single men receive 300 dinars ($194). If its plan to entice the militias with financial incentives proves untenable, the NTC may have to coerce the brigades to disband. But with the country trying to turn the page after eight months of bloodshed, it is a step the council is reluctant to take. While months of air strikes and a few hundred Qatari Special Forces troops on the ground proved to be enough to shatter Colonel Gaddafi’s regime, the Western Alliance could not – nor did it intend to – fill the resultant security void. NATO and its partners simply recognized the Benghazi-based NTC and its allied armed formations as the legitimate authority, supplied it with aid and resources, and hoped for the best. The problem, of course, was that the Libyan rebels were never an army; they were a patchwork of small local militia units, deserters from the regular army, and a smattering of former exiles with military experience. Moreover, the recognition extended by foreign powers to the NTC was far in advance of the extent to which Libyans, even many of those in the forefront of the battle to oust Gaddafi, were willing to accept its lead. The fact that the rebel leadership had not established an alternative power center meant that the collapse of Gaddafi also meant an effective collapse of state authority. The challenge now facing the rebels is to build a new state on the ruins of the old, and the first order of state-building business is establishing a monopoly on military force within its borders. The NTC is struggling to meet that challenge. The situation is particularly grim for residents of towns and neighborhoods thought to have supported Gaddafi, which are routinely subject to abuse by fighters. The NTC may talk of “national reconciliation,” but it has precious little control over fighters whose actions imperil that objective. Instead, the NTC is forced to accommodate them. Even as tribal and regional schisms intensify the sometimes violent contest among the different militia formations, the alienation of communities that had supported Gaddafi’s regime also creates fertile soil for an insurgency. There are certainly plenty of men of fighting age (many of them armed) who fought for the old regime. In some Tripoli neighborhoods, pro-Gaddafi graffiti still reportedly goes up nightly. And British officials warned late last month that a number of top al-Qaeda leaders have left Pakistan for Libya, looking to take advantage of the security vacuum to set up shop. Interestingly, the main channel of propaganda of the old Gaddafi regime, Al-Jamahiriya, has resumed its broadcasts on the Egyptian satellite Nilesat, provoking the ire of ex-rebel fighters. The channel, which had stopped broadcasting in the wake of the “liberation of Tripoli” in late August, reappeared under a new frequency, broadcasting speeches and songs in praise of the former “Guide” Gaddfai, killed in Sirte. The news of this has made ​​the rounds of social networks, and some have called for demonstrations outside the Egyptian embassy. The security challenges would be more manageable if a political consensus existed on the terms for building a new democratic state in Libya, but that, too, remains elusive. The NTC has been beset with challenges over its less than transparent composition and process of selection – in December it even faced a tent-city protest established outside its headquarters to demand that it disclose its membership and make public its decisions. The Misrata and Zintan militias don’t trust the Benghazi rebel leadership, and they shamelessly use their military muscle to demand a greater share of the political pie until their political demands have been met. Last month, an umbrella group claiming to represent 70 percent of militia fighters demanded that the NTC grant them 40 percent of its seats. The conflict among the militia is inherently political: It’s the form in which rival tribal and regional groupings are staking their claim to power and resources in the post-Gaddafi order. And it’s far from clear how the formal political system being put in place to regulate such competition will ease tensions. Yet, the criteria by which the NTC selects its own members has not been made public. The draft law setting rules for elections to be held in June that the Council released for discussion suggests that the promise of elections may not resolve the emerging schisms. The draft evades the highly-charged issue of districting, meaning that there’s no clarity on how many seats in the new legislature will be allocated to each town and region, a decision that will shape the distribution of oil wealth in the new system. The draft law also plans to exclude as candidates those who hold positions in the current interim government and its local and military councils, officials of the former regime and those deemed to be late adopters of the revolutionary cause. This is the downside of “intervention lite”: It’s a lot easier to take down a regime, as the U.S. learned in Iraq, than it is to establish a new order. Yet in Libya, the forces trying to establish that new order are far weaker than those in Iraq, even if some of their leaders — most notably NTC President Mustafa Abul Jalil — enjoy the advantage of a legitimacy never accorded to the U.S. in Iraq. Given the mounting threat of chaos, Jalil’s authority may not be enough. The militias’ dominance in Libya has now reached a crucial crossroads, with the recent appointment of a chief of staff for the new national army. Until now, the militias have said they cannot surrender their weapons and allow their fighters to be absorbed into the army because the command structure was not in place. By naming Yousef al-Manqoush, a retired general from Misrata, as head of the armed forces, the NTC presents the militias with a choice – they must either start ceding control to the army or openly defy Libya’s leadership. In an interview broadcast on Libyan television, al-Manqoush said the mechanism for absorbing former militia fighters into the military would be ready soon. “My message to the revolutionaries is…they have to prove to the world once again that they are patriotic Libyans, prove to world that they will integrate into the state’s institutions and work on building a strong national military,” he told Libya Al Hurra television. Almost three months since the country’s liberation was formally declared, Libya feels calmer and less volatile than many had predicted. But the continuing presence of the militias is seen as a serious – and growing – threat to stability. Disarming them and persuading them to integrate within the national forces is now arguably the greatest challenge facing this fledgling government as it tries to establish security before elections planned later this year.